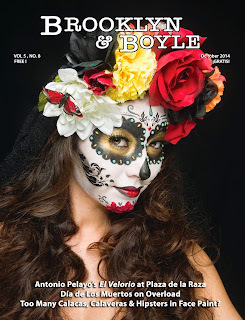 Brooklyn & Boyle | Art and Life in Boyle Heights : Sixth Annual Dia de Los Muertos Issue! 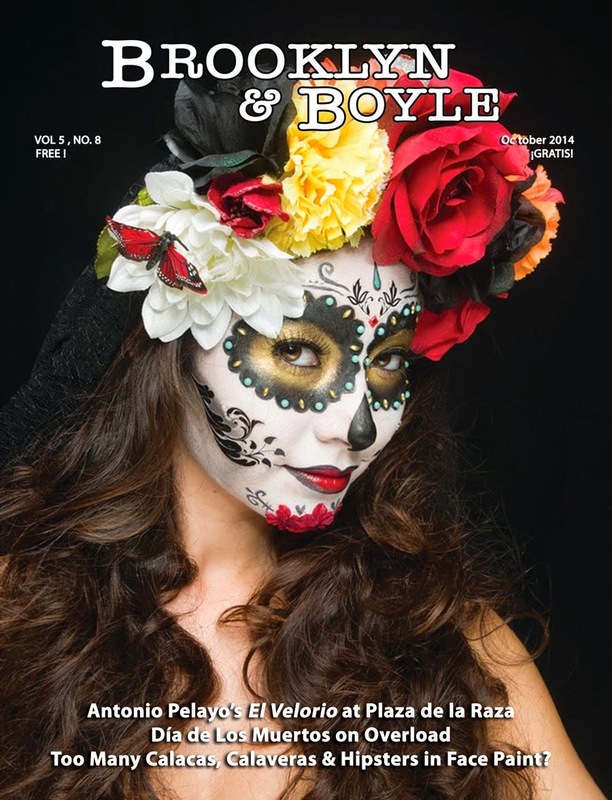 Sixth Annual Dia de Los Muertos Issue! Six years ago, when I began the epic experiment that would become Brooklyn & Boyle, it was, essentially to nurse a broken heart and a nearly broken spirit back to life with a return to work as a writer, work I had begun in earnest while still a child. Had a grand total of $80 and a laptop borrowed from the DJ sound booth at Eastside Luv wine bar y QueSo to get started. I had no idea it would last as long as it has. I was told by Mark Kraus at Josefina Lopez' Casa0101 Theater today that the paper appears to be very well established. Admittedly, it has been the toughest struggle I've ever faced. We still fly by the seat of pants on a shoe-string, but along the way I've been blessed with the opportunity to meet, share and work with countless creators and makers of culture, art & artesanía. In the spirit of gratitude we offer this Saturday's survey of cover art from Armando Duron and his family's collection at Rock Rose Gallery in Highland Park. He has all 42 editions. We started with a Dia de Los Muertos issue in Nov. of 2008. And here we are again. This issue has to be out by next week. I simply wanted to thank everyone all the patience, kindness, love, friendship and willingness to forgive, even when I didn't deserve it. This will be our sixth Dia de Los Muertos edition, so we especially want to thank the advertising sponsors who come to our aid over the years. I'm especially excited with new additions to our volunteer staff and with the growing number of young writers and artists who get it. Obviously, there is still some last minute room to get your Day of the Dead event, special, party or exhibit included. Or rates are economical and when you buy and ad you support the arts in a very direct way.